Last night I slept in my own bed in Vancouver. When I got up this morning I had a shower and some cereal with real milk. I walked to a nearby coffee shop and here I sit with a cappuccino in front of me as I attempt to carve some words around the past few days and the completion of our trip. These simple pleasures seem more like luxuries now. Nothing like 55 days on a rowing boat to add some perspective. I’m sure this will wear off somewhat over the coming weeks and months but I hope it doesn’t fade away completely. I hope I don’t forget how lucky I am to have the life that I have. We arrived into Cambridge Bay on Wednesday afternoon. The last 24 hours of rowing was great, we covered about 70km, conditions were calm and the sun even showed up for most of the day on Wednesday. When we arrived, we met some people at the dock who are sailing through the passage and it was very interesting to hear about their trips. I found it somewhat hilarious how fast they can move relative to us. One of lads I was chatting to was telling me that more than 50% of the time, they are using their motor. The initial 24 hours after arriving to Cambridge Bay were very chilled out. We spent our time eating some real food, cleaning ourselves and our clothes and quite simply just relaxing. 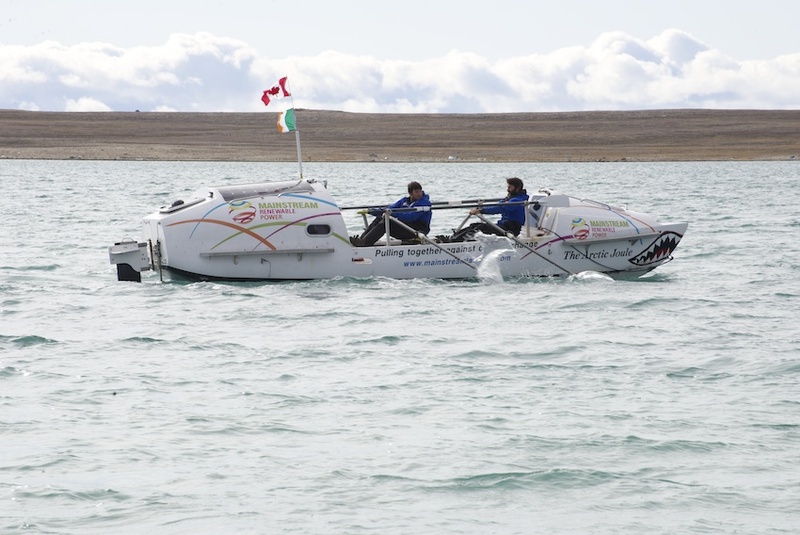 The two Aussie lads (Mat and Cam) made it to Cambridge Bay on Wednesday a few hours after us and the Kayakers from Quebec (Oliver and Sebastian) who we met in Paulatuk nearly a month ago also arrived on Wednesday. They paddled in at exactly the same time as we rowed in (we met them out on the water) so it was fantastic to see everybody again. We have had an amazing experience over the past 55 days, for me it’s probably too soon to try and articulate all that I have learned over this time. That will come naturally over the coming weeks and months. We decided to end our trip in Cambridge Bay (this decision was made a few weeks ago when we knew that making it to Pond Inlet wasn’t going to happen). Of course we would love to have made it to Pond but travelling through the Arctic, it is absolutely essential that one considers facts and probabilities and not false hopes and wishes. The consequences of poor decision making up here is too serious. The reality is we would probably need another 2 months at least to make it to Pond Inlet which simply means we had no hope of making it this year. In making our decisions, we have also paid very close attention to what the locals have told us along the way as they are the people who know the most about the conditions up north. We probably had another 3 to 4 weeks of open water at most before the freeze begins. This means we would be cutting it very close to even reach Gjoa Haven which was the next community from Cambridge Bay (about 500km away). If we got stuck by ice before making it to Gjoa Haven, then we would potentially be relying on a rescue to get us out and this was simply not an option for us. Could we make to Gjoa Haven within 4 weeks? Potentially yes but the experience we have accumulated over the past 2 months suggests that would be wishful thinking and very unlikely. As much as it wasn’t what we had originally wanted, I know we were 150% correct in our decision to finish in Cambridge Bay. I suppose in a way, this is the nature of adventure particularly when it comes to human powered trips where the forces of Mother Nature have the ability to stop you in your tracks. Sometimes you just cannot get to where you originally intended. To be honest, I’m actually not that bothered by the fact that we didn’t make Pond Inlet as the experience we have had over the past 55 days has been incredible and I’m looking forward to sharing the stories with friends, family and clients over the coming months. It’s only now having internet access once again that I have had the chance to see many of the notes and comments in relation to our trip and I would like to say a sincere thank you to everybody who has taken the time to add notes and comments of support for us over the past few months – I really do appreciate this. I have also seen the negative messages which in some cases seem quite angry in their tone. All I can say about that is we’re all entitled to our opinion so good on you for voicing yours. I think life is a very precious gift, it can be taken away from us in an instant so I just want to continue living my life, pursuing my own dreams and leave the criticizing to others. Personally I’d much prefer to be criticized for doing something I’m truly passionate about than to be spending my time criticizing others. In my opinion life’s too short for that. It seems that our trip has stirred some debate around climate change which is great. Some people think it’s all nonsense and others believe the threat it presents is real and would like to see more done about it. I’m not a climate change expert but I do believe climate change is real and simply put I think we can do a better job at looking after our planet. The local people we have met up here have all spoken to us about the changes they have seen over the past 20 years and the facts are things have changed and are continuing to change up here. As I mentioned above, this has been an absolutely incredible experience. I am genuinely humbled and also honoured to have had the opportunity to travel through this incredible part of the world and meet some amazing people. I would like to express a sincere thank you to all the people we met up North. You have been so genuine, so warm and so welcoming to us which absolutely enriched this experience for all of us. Personally I have found it really fascinating to simply listen to the local people, hear their stories and get their perspective on all sorts of things. There are a lot of people I want to thank who have helped us make this expedition happen and I plan to thank most of them in person over the coming weeks. To Chris and Dave at Restore Physiotherapy thank you so much for putting me back together over the past year and a half. I would not have been on this boat if it weren’t for your expertise, patience and support. To all our friends who helped out in so many ways, beers are on us now that we’re back. To my family, thank you once again for putting up with me and for your unconditional support. To everyone who gave so generously of your time especially in the early stages, thank you for believing in us. Maria LoScerbo at Epic PR, thank you for all your hard work over the past two months. You are a genius and have been an absolute rock star for us. To Tori Holmes thank you too for all the work you have done on this. To Niamh Cunningham, you were a huge and essential part of making this trip happen. The reality is this expedition would not have happened this year without you so thank you so much for everything you have done. I would like to say a very special word of thanks to Dr Eddie O’Connor and the team at Mainstream Renewable Power. Thank you for believing in us and thank you Eddie for being so passionate about protecting our planet. I’ve been asked already by friends and family what it’s like to be back. Obviously it’s great but I also sort of miss the North and I suppose the adventure of what we were doing. I know it’s only been a few months but it feels a little strange being back in a city again. So what’s next is another question I know will come over the coming weeks. When I think of the future, there’s so much I’m excited about, this blog would become a book if I tried to articulate all that. For now, the cappuccino has been finished, it’s a gorgeous day today so I think ill go for a run. Until the next time…….